I was adopted by a really nice family! And they might be back to find me a friend! I am an adorable little girl and everyday I excitedly await the perfect forever home. To run off that extra energy, I like to hop and run outside with the volunteers watching over me. I love having their attention and being pet and loved, a bunny's dream come true. Once you meet me, I will easily hop into your heart! Be sure to check out the other photos on my Petfinder page! I am waiting for you at the Oakland Animal Shelter, so no need to email or anything if you want to meet me, just come on down and visit! You can find directions and hours on our website. 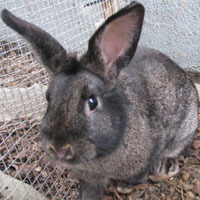 If you are interested me as a friend for your single rabbit, I would be a great choice! Please bring your rabbit to the shelter any Saturday or Sunday between noon-4pm to have a "bunny dating" bonding session with me!